It occurs only on this VM, so it could be due to the existing partition. I am not sure it is a duplicate because in this case, I don't even see the partman screen and cannot choose any partitioning scheme. Here are the logs from my latest test. Ubiquity hangs in step 'prepare' and never switches to the partitioner. /me did not want to fix replace method. Thanks jibel, will look into this. 11:38 < xnox> slangasek: the root cause is unclean unmounting of the /target resulting with "journal replay required" on first mount. 11:39 < xnox> slangasek: which is cleared if you at least boot your system once, but not fine if you don't. 11:39 < slangasek> xnox: ah; so this is only a problem for people who are serial installers? 11:40 < xnox> or force power-cycle shutdowners. So this doesn't appear to be a stop-ship bug. We can take the fix if we need a ubiquity upload for something else, but as long as the journal is replaying cleanly when users are doing a normal install, this seems to be a bug that's primarily relevant to testers and is therefore release-notable. I have tried to reproduce this scenario in kvm and I cannot so far. I will try a couple more times. Is Virtualbox required to reproduce this bug? Reproduced with identical procedure in kvm. I gave VNC access to Dmitrijs for debugging. 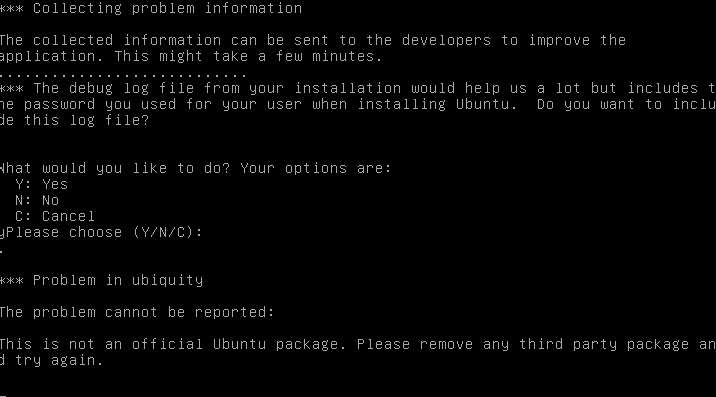 Please file a new bug with `ubuntu-bug ubiquity` after reproducing your crash / hang. You can do so from TTY1 by pressing Ctrl-Alt-F1 Such that all the logs are attached. Without logs, it's impossible to investigate and your crash could be different to this bug. This is the daily Ubuntu Quantal ISO for October 17.